After stirring national debate earlier this year, Wellesley has updated its official stance towards trans women — a move which has caused both celebration and skepticism. 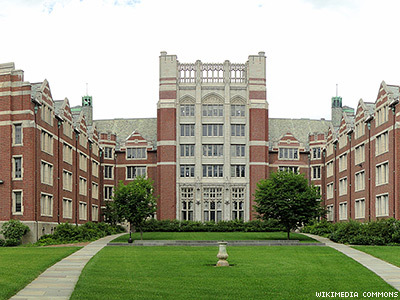 Wellesley College this week clarified its stance toward including trans women, stating that the admissions department will accept applications from any student who "lives as a woman and consistently identifies as a woman," reports the Boston Globe. After a year-long committee evaluation, the Seven Sisters school will now join U.S. women's colleges Bryn Mawr, Scripps, Simmons, Mount Holyoke, and Mills in explicitly accepting trans female students. Wellesley will also admit students assigned "female" at birth who do not identify as male or female, as well as allow trans male students who begin openly transitioning partway through college to graduate, according to a school-wide letter from Wellesley's Board of Trustees and president H. Kim Bottomly. However, unlike recent policies put forth by Simmons and Bryn Mawr — which indicated that the schools were open to any students assigned "female" at birth, regardless of whether they identified as "male" at the time of submitting an application — Wellesley will not accept applications from trans men. Further, the Board clarified that school communications would continue using female pronouns to address the student body. Although, as the Globe notes, the Board's letter never used the word "transgender," statements like these appear to reference debates that have been ongoing at the school, and which were recently profiled in a New York Times magazine article, "When Women Become Men at Wellesley." In it, journalist Ruth Padawer noted that many students, some of whom are trans men, have asked the administration to refer to students with gender-netural language, including changing the word "sisterhood" to "siblinghood" in all student body-wide communications. Requests like these stirred debates nationwide about the origins and purpose of women's colleges after the article was published. As one trans writer, Adrian Scott Duane, put it in an op-ed for The Advocate, "As a fellow trans man, I have empathy for these guys [asking for "siblinghood" language]. Our genders are hard-won. ... But women's colleges are not the place to wage this war. Women's colleges are places that were also hard-won, built defiantly in a time of all-male higher education." Another commentator, trans male Wellesley alum Tim Chevalier, highlighted in The Advocate the transphobia and misogyny many believe is inherent in women's college policies that accept trans men but claim that trans women "threaten" women's space. In response to Wellesley opening its doors to trans women, many advocates are celebrating — but others say that work remains to ensure that what is stated on paper happens in reality. As Chevaliar explained to the Globe of the new policy: "[It] seems carefully crafted to satisfy those of us who want to see Wellesly admit all women, while leaving the college plenty of plausible deniability with which to reject trans women on the basis they they aren't 'living as women.'" Genny Beemyn, director of the University of Massachusetts-Amherst's LGBT resource center, added that they prefer a policy that accepts all trans-identified people, as many young trans women would likely be unable to change legal documentation that identified them as "male" before applying. This is the very situation that brought national attention to Smith College in 2013 when trans woman Calliope Wong's application was rejected because she was unable to update her federal or Connecticut state ID to reflect her authentic gender. Smith is still currently reviewing its admissions stance towards trans women. Wellesley will begin openly admitting trans female students in the next admissions cycle for the graduating class of 2020.